The Western Front in WWI stretched between the North Sea and the Swiss border and it changed very little from when it was established at the end of 1914 for much of the war. This stagnant line defined the WWI as one of stalemate despite battles with massive casualties designed to break the dead lock. The Battle of Passchendaele(1917) 487,000 joint casualties. I was recently reading Eddie Rickenbacker's Autobiography(*), "Fighting the Flying Circus". where he described the front on April 10th 1918. (see green box in the image below). From Fighting the Flying Circus, page 14 Chapter 2. We were two miles east of Toul, one of the most important railroad connections on our side of the front and a town that the enemy tried almost daily to demolish with aeroplane bombs. We were barely 18 miles from the lines and in a country covered with rolling hills and extensive forests. Nancy lay fifteen miles to the east of us. Luneville 12 miles further east and the highway from Toul to Nancy to Luneville lay parallel to the enemy lines and within easy shelling distance of the Hun guns. But along this highway one would not have realized that a war was on. East of this point no efforts had been made at an offensive by either side. Business went on as usual in Luneville. Children played in the streets and traffic pursued its leisurely way. An occasional German sentry faced a French sentry along the lines from Luneville to Switzerland, at intervals of a hundred yards or so, but it was said that these sentries messed together and slept together for the sake of companionship. This unnatural situation was considerable altered later, when the Americans came in. The country of the Vosges Mountains was thought to be too rough to permit invasion by either side. Checking for WWI Battles in the Vosges Mountains I found a few battles in 1914 and 1915 but after October 1915, and the battle of Linge (17,000 soldiers died) there doesn't seem to be a lot of activity on this broad 120 mile front. With casualties so high in the war why had their been no serious effort by either side to exploit this supposedly lightly guarded 120 mile (200 km) gap between Luneville and the Swiss Frontier? Were the Vosges Mountains so un-passible that an army on foot was better off charging into interlocking fields of machine gun fire west of Nancy at Verdun, the Somme, and Passchendaele? (*) Eddie Rickenbacker was The United States top ace during WWI. The Great War on the Vosges Front. 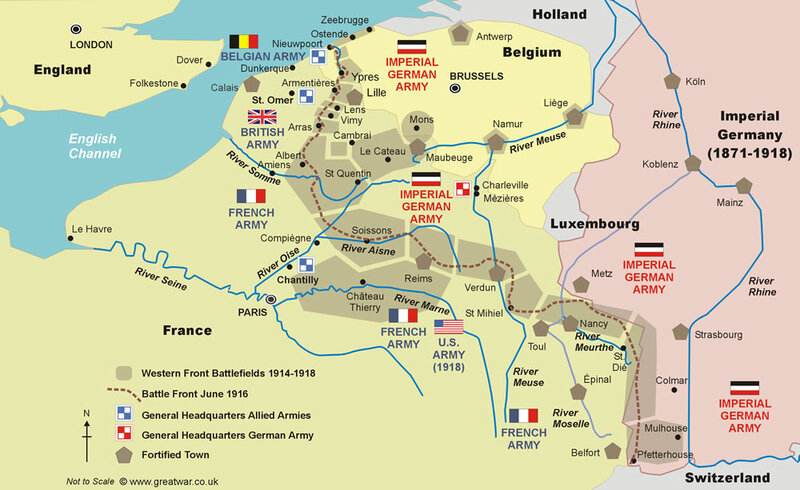 Locations of the 1914-1918 Battlefields of the Western Front. The Flanders front was flat. The typical WWI soldier got clothes, a rifle, a knife and a shovel and was almost ready for action in such a terrain. A really broken line here means an enemy is free to move as much he is able to, logistics more often than not being the limiting factor. The Vosges are quite steep, have almost half a year of Russian Winter on them, and both sides fortified their lines after the Franco-Prussian war of 1870. The French had an Iron Line (Barrière de fer) built immediately behing the mountains and the Germans built bunkers and block houses along the highest points of the whole range. At the start of the war they had trenches that were already made of brick. Breaking a line in such terrain means you face just another steep hill next. Note that the Wikipedia states the French fortifications were already obsolete at the start of the war. That is an anachronistical assessment by "bullet points". The Germans always had considerable difficulty in dealing with such fortifications. The most famous of these forts had a rather known name: Verdun. In such a terrain you need mountain troops. Significantly more expensive to train and equip, much smaller numbers available. Logistics a nightmare. Just compare the Austrian and Italian experience in the Alps. That said, one personal account of a snapshot in time does not capture the reality of 4 years of war. The Hartmannsweilerkopf did change hands 4 times alone in one campaign – with 30 000 dead – and was called the Mountain of Hell or the Man-eater-hill. There is one of four French memorials commemorating the war nearby. VOSGES MOUNTAINS, a range of hills in the E. of France, bounding the valley of the Rhine on the W. and parallel with the Schwarzwald in Baden. They are connected in the N. with the Hardt in Rhenish Bavaria, in the S. W. with the Faucilles, the Côte-d'Or, and the Cévennes, and in the S. they unite with offsets from the Jura. The summits are usually rounded, hence called ballons, and are covered with a rich green turf, on which for six months of the year large herds of cattle graze. Their sides are clothed with forests of fir, oak, and beech. Their highest summits range from 3,000 to over 4,000 feet, culminating in Ballon de Gebweiler, 4,700 feet above the sea. In those mountains was carried on severe and almost persistent fighting during the World War. because in the Vosges mountains, where they did try the same as everywhere, an army on foot would be charging into interlocking fields of machine gun fire as well, but additionally in much worse terrain, climate, and the enemy usually holding the high ground. He saw his first action in August 1918, amid the mud and mire of the Vosges mountain range in Alsace-Lorraine, firing an artillery barrage and being fired on in return. The captain stood his ground. Many of his men did not. He cursed them for it, and won their respect. You are referring to a region regained by Germany in the treaty of 1870 after being French for a couple of centuries. Bombarding the civilians would probably not have been the best method of regaining the territory. France had significant forces in Belfort, a garrison town. It had been impregnable in 1870. In 1870 Germany learned that all it needed to do was to get to Paris ... A method that worked again in 1940. What surprises me is how little defended this line was by the Germans. On the 4th of August 1914 the French army (who had been grouping at the summits), simply rode down into the valleys. 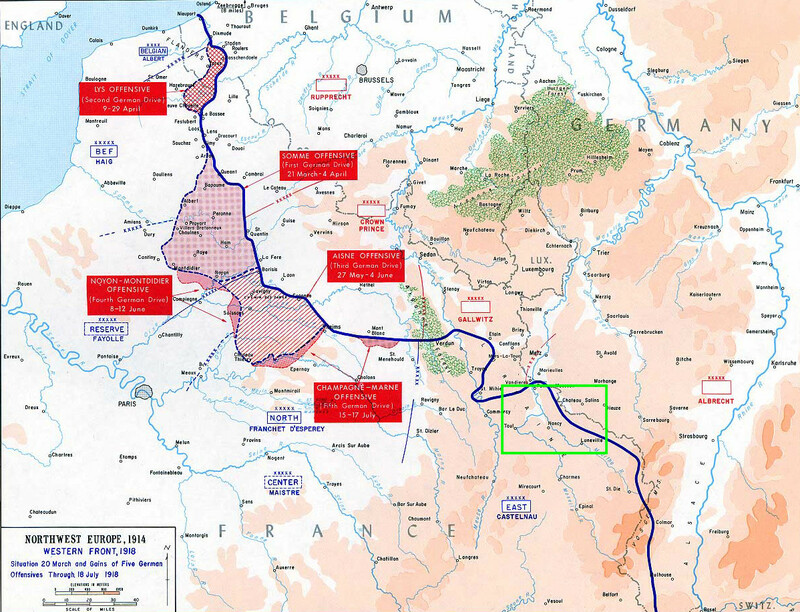 Germany pulled back it's forces to the plain of Alsace, and the front was established. The stalemate was maintained and the German command became wary of the local soldiers lack of appetite for war. Local soldiers were rerouted to the eastern front and the navy. The menfolk of the occupied territories were deported to the south of France. The bulk of the French forces were rerouted to the route to Paris. Why was the massive Human Wave attack used in WWI? Why did trench warfare accept deadlocks? Re: WWI, is the term “Allies” a retronym?